I made this watercolor based on the pinball game Monster Bash for Liz Prince. She has 2 very real and cute monster cats herself: Dracula and Wolfman (depicted playing guitar and drums respectively.) 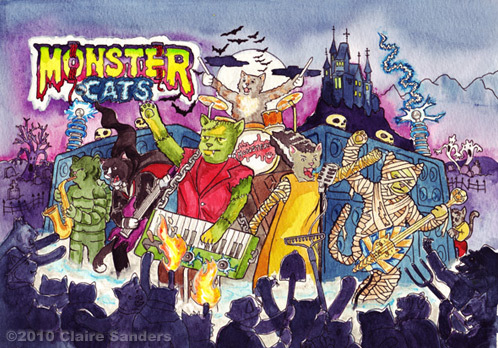 The premise of the game is that Universal's monsters got together and formed the most rockin' band ever, but I made it better by turning all those monsters into cats. Speaking of pinball and cats, Alec and I just went to the Pinball Wizard Arcade in Pelham, New Hamshire. They have tons of awesome pinball machines and great 80's arcade games. They also had a pinball machine there I had never played called Bad Cats. I did horribly but I really like the concept of a cat filled game. My favorite pinball machines are ones where they don't have a preexisting license slapped on, instead the game designers were free to make up their own hilarious characters.